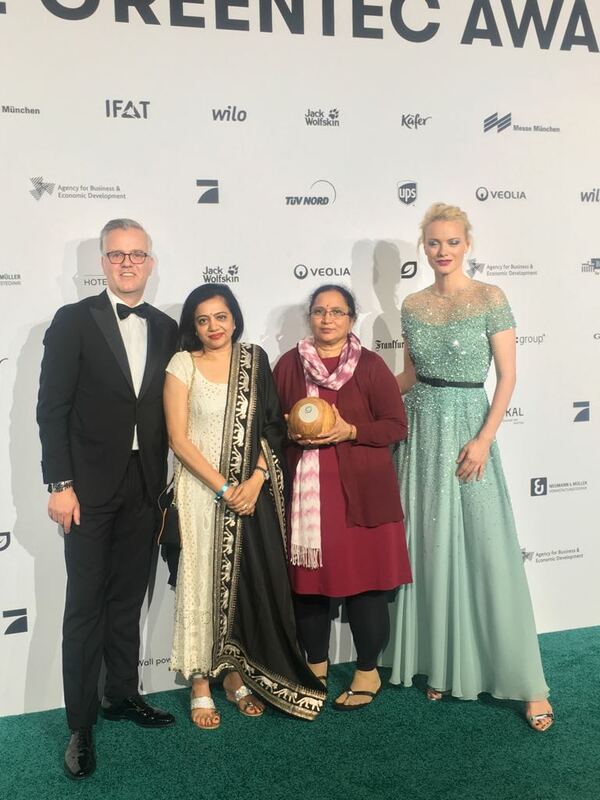 Association of Lady Entrepreneurs of India (ALEAP) – Entrepreneurs tackle waste – has been awarded winner 2018 under the Category Resources & Recycling by Veolia! The Association of Lady Entrepreneurs of India turned growing rubbish piles into a prospering business and source of employment at the Gajularamaram Industrial Estate. ALEAP set up a vermicompost plant and a handmade paper plant which, besides producing 15 tonnes of compost and 1.75 tonnes of handmade paper per month, provide a source of income for three people. The facility also acts as an incubator, training women to set up similar businesses. Till date, over 1,000 women have been trained; 1,000 vermicompost plants and 5 waste recycling plants have been set up in the State of Telangana. Since their foundation in 2008, the GreenTec Awards have become the most important environmental award worldwide. Together with 120 partners, they provide an international stage for large and small companies, NGOs, initiatives, athletes, celebrities and activists to present the best projects dedicated to environmental protection. The GreenTec Awards reward, integrate and communicate Green Lifestyle. On May 13, 2018, they took place for the 11th time – this year as the opening event for the IFAT, the World’s Leading Trade Fair for Environmental Technologies in the ICM Munich.